The Joy of Sets Facebook Group opened an album this week for us to pay homage to the soon to be outgoing Stampin' Up! catalogue by CASEing projects from it and sharing them in there. It's being populated fast with some gorgeous projects. I made these two offerings. The first uses the Eastern Palace design suite, with a card base of Tranquil Tide, an overlay of Very Vanilla and one of the DSP designs from the suite. It also uses a couple of the dies from set to create the cut out and one of the large gold stickers as well as making use of the cute tassels and of course the stamp set with a little bit of Berry Burst Ink. It's quite a large card and well out of my usual comfort zone so I enjoyed making it. At least the dies and stamps will still be available in the new catalogue. The second is much more 'me'. This one uses nearly all retiring products so if you like the look of this one you might want to grab those products while they're still available. 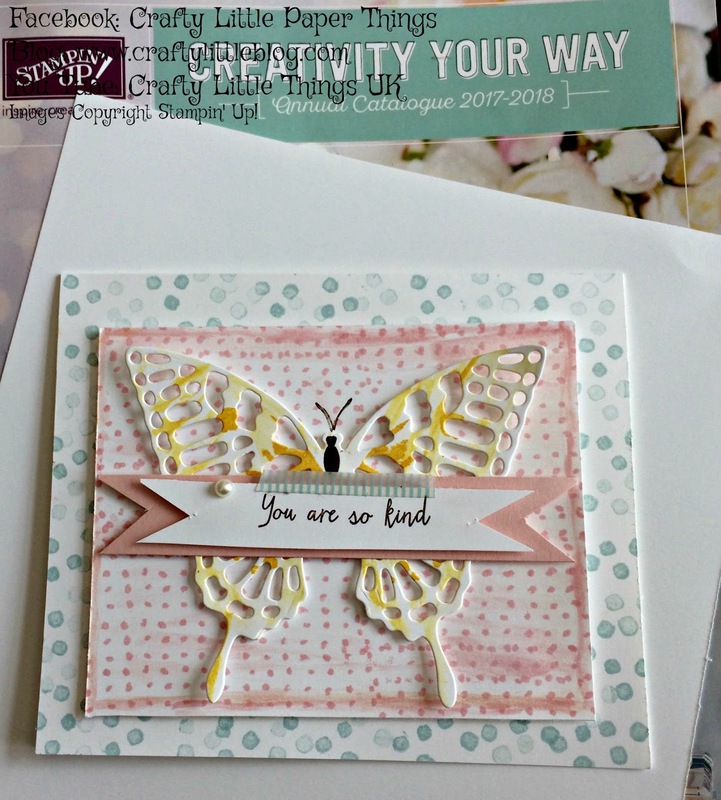 This one is on a simple Whisper White base which has been stamped with retiring Soft Sky using one of the stamps from the Watercolour Wings Stamp Set. 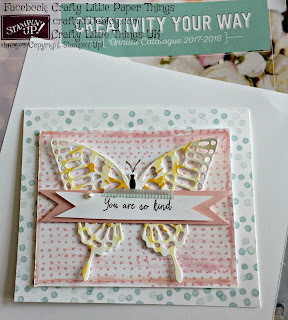 The layer on top is also Whisper White stamped using retiring Pink Pirouette and again using the same stamp set. This layer is washed out using an aqua blender. The butterfly is stamped using Daffodil delight and one of the large butterfly images for the wings from the same stamp set again. 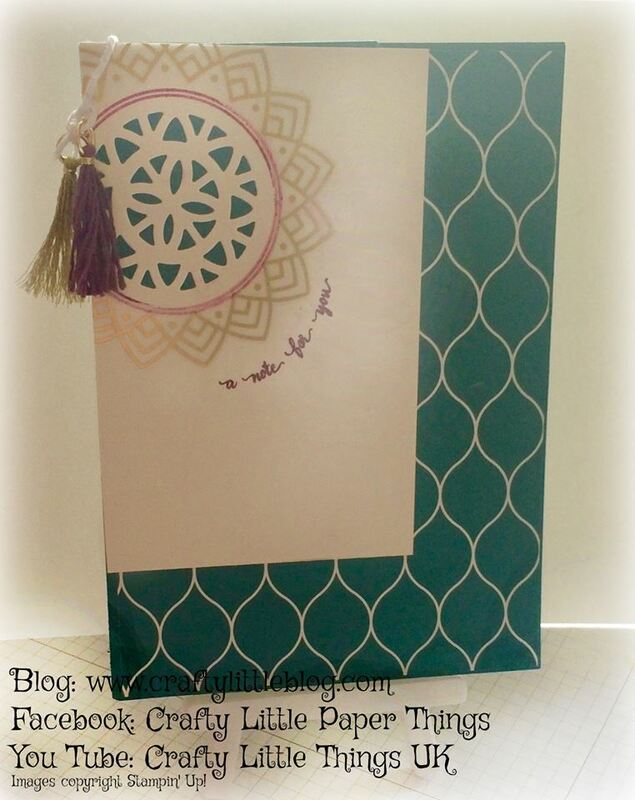 The ink is watered and spread across the die cut design using an aqua blender again. The butterfly was cut using the Butterfly Thinlits set, also retiring and it was finished off with a touch of Wink of Stella and the body stamped with Soft Suede and antennae stamped onto the white card stock using Early Espresso ink. 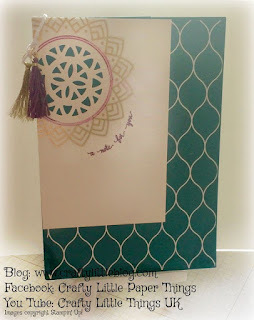 The whole things was put together with dimensionals and mini dimensionals and finished off with a sentiment from the same stamp set stamped in Early Espresso onto Whisper White and trimmed to fit on top of a slightly larger piece of Pink Piroutte card stock. A large basic pearl was added and that completed the look. It's not identical to the one in the catalogue but it's my best shot. There is a video for the second card giving an in depth tutorial but it will not be uploaded until Sunday 15th April 2018, subscribe to my channel and click notifications to catch that if you don't want to miss it. If you've lost your mojo or just need some inspiration why not have a go at a CASE projected from the current catalogue and join Joy of Sets to share it.